Gail S. DePaola, 81, wife of 51 years to the late Theodore C. DePaola, Sr., passed away on Monday, January 28, 2019 at the MidState Medical Center surrounded by her family. She was born on January 23, 1938 in Hartford, daughter of the late Captain Bertrand and Dorothy (Lyon) Sawyer. Gail graduated from Meriden High School Class of 1956. 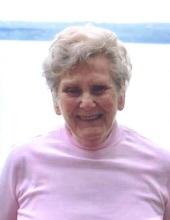 She was a retiree of Hartford Hospital and was a member of St. Andrew’s Episcopal Church in Meriden. Gail is survived by her daughter Debra Cooper and her husband David, of Wendell, N.C.; sons Theodore DePaola, Jr. and his wife Heidi of Southbury, Gary DePaola of Meriden, and Raymond DePaola and his wife Joy Roy of Enfield, N.H.; grandchildren Christopher DePaola of Southbury, and Douglas and Matthew Cooper of Wendell, N.C. She is also survived by her sister-in-law Eleanor Sawyer of Meriden. Gail was predeceased by her brother Bertrand K. Sawyer. Gail’s family would like to thank the efforts and support of the teams of Masonic ACU unit and MidState Medical Center’s Pavilion C and Critical Care Units. Relatives and friends are invited to visit with Gail’s family on Thursday, January 31st, from 9:00 to 11:00AM at Beecher & Bennett-Flatow Funeral Home, 48 Cook Ave., Meriden. Her funeral service will take place at 11:00AM in the funeral home and burial will follow in Walnut Grove Cemetery, Meriden. In lieu of flowers, donations in Gail’s memory may be made to the Alzheimer’s Resource Center of CT, 1261 South Main St. Plantsville, CT 06479; Masonic Charity Foundation of CT, 22 Masonic Ave., P.O. Box 70, Wallingford, CT 06492; or American Lung Association of CT, 45 Ash St., East Hartford, CT 06108. To share a condolence with Gail’s family, please visit www.beecherandbennett.com. To send flowers or a remembrance gift to the family of Gail S. DePaola, please visit our Tribute Store. "Email Address" would like to share the life celebration of Gail S. DePaola. Click on the "link" to go to share a favorite memory or leave a condolence message for the family.